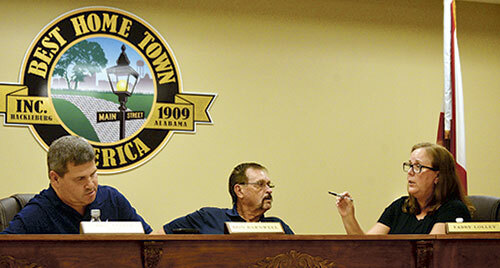 Hackleburg Town councilwoman Tabby Lolley (right) speaks to mayor Darryl Colburn (left) and councilman Don Barnwell during the Aug. 27 council meeting. HACKLEBURG- An effort to move the Big 95.5 radio station into the old Hackleburg Town Hall building failed to get a majority vote during the Monday, Aug. 27, Hackleburg Town Council meeting. The vote was split 3-3 with councilmen Kevin Barnwell and Eugene Marbutt and councilwoman Tabby Lolley voting no. Mayor Darryl Colburn, councilman Don Barnwell and councilman Darrin Wiginton voted yes. On July 23, Big 95.5 owner Hutty Hutcheson spoke to the Hackleburg council and requested the use of the building, which now serves as a gymnasium and polling location. The Hackleburg council held a work session on July 26 but couldn’t agree on a contract that called for a 20-year lease with Hutcheson. The proposed contract stated Hutcheson would pay $200 per month to lease the building.